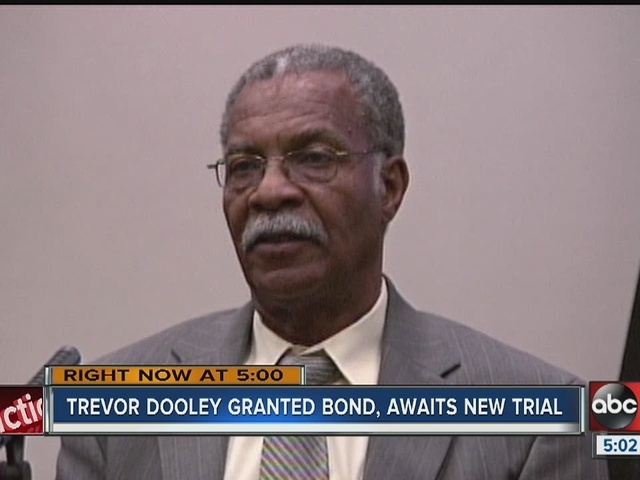 Trevor Dooley walked out of the Hillsborough Co. Jail Thursday afternoon three years after he was booked. A judge granted him bond on Wednesday , as Dooley waits for a chance at a second trial. He didn't say a word or answer any reporter's questions as he walked out of the jail and into a truck. The 75 year-old used a walker and sped off with the help of his bail bondsperson. Dooley hasn't said much to reporters since he was convicted of shooting and killing his neighbor David James in 2010 during an argument about a skateboarder who was on the neighborhood's basketball court. He spoke on the stand during his trial in 2012, admitting to pulling the trigger, but not directly answering whether he'd killed James. James died in front of his daughter. Instead, Dooley only admitted James died after he pulled the trigger. Kanina Eurez, James' widow told ABC Action News, while she wasn't surprised the judge granted Dooley bond, she doesn't think he should get another chance.